Anyone who has been reading the Circus for any length of time will soon realize that there are very few games that I appreciate more than what Ken B., of Fortress: AT fame, coined as “Dudes on a Map” (DoaM) games. 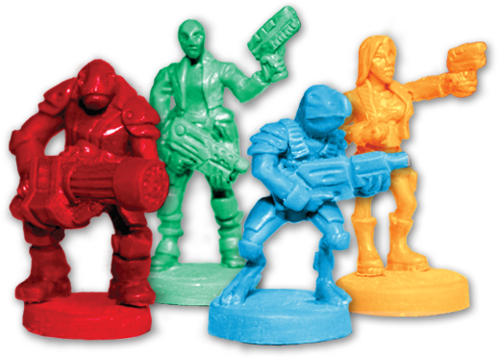 There’s just something about the idea of having a group of friends playing a game for several hours, using long-term gambits and overarching strategies to take control of the known universe. I have a hard-on for these kinds of games, and one that cannot be squashed, not even by a cold shower or Machinist’s hammer. Risk Legacy, Ikusa, Conquest of Nerath, and now, City of Remnants from Plaid Hat Games, are all recent examples of this style of play. And, surprisingly, it is also one of the most underrated and least mentioned DoaM games of all time. Yes, it is that good. The game is set in what amounts to a futuristic prison city that was created for the sole purpose of storing the survivors from a malicious alien race’s perpetual war of conquest. Like most prisons, this one is a melting pot where profit-minded individuals banded together to form gangs, kill rivals, steal stuff, and the best part, create giant factories that spew out drugs. Yeah, that’s right, it is absolutely a game about drug-dealing space gangsters, which is utterly awesome in every way. It really doesn’t get much better than that in this life. 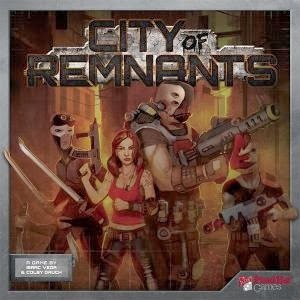 From a mechanical perspective, City of Remnants is a race for victory points, with multiple paths available to achieve that goal. Several factors come into the fold in order to be more effective, one of which is an “influence” mechanic that rewards having a large gang, an effective drug production and distribution network, and simply having a lot of money. The more influence you have, the more effective you can be, and this is abstracted via a points system that represents not only your influence, but the strength of your available actions. Higher influence allows you to move more miniatures about the board per round, which in turn allows you to expand your criminal enterprise more swiftly as well as make your gang army more effective in combat. The system is so smartly designed that it’s a joy to play from virtually every perspective, with everyone’s singular complaint being that the game is slightly too long. That said, you can shorten the length by lowering the amount of available victory points, and I’d add one more complaint: there’s a rather steep learning curve despite the rule book being well organized and written in an intelligent, intuitive manner. 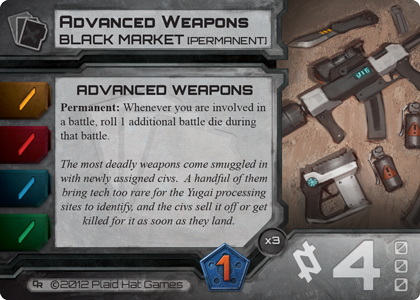 The components in the game are mostly great as well dark, gritty card artwork, which is easily the high point of the overall aesthetic. It’s got a ton of beautiful, little miniature models to represent your gang members, and it’s got hundreds of wee bits, with mostly good artwork, to track all sorts of things. One of the most impressive parts of the design are the gang tracking sheets, which double as quick rules references; these things are marvelous when it comes to providing all the information in a simple to understand manner. That said, as nice as the art is, there are some questionable design facets from the practicality perspective in some of the little things. On the back of the building tiles that get placed on the board, there are just some icons and a name; the large icon is matched to a card which tells you what the building does. There’s so much space left that it would have been great to ditch the symbol and just write the text of what the building does right onto the building itself. All this said, the game looks outstanding, aside from the board itself, and your eyes will most assuredly be feasting. Now, Jerry Hawthorne, designer of Mice and Mystics and Plaid Hat regular, myself, and some of our mutual friends had a conversation at GenCon about what makes a game attractive to buyers, and while I disagreed at the time, after deliberation I think he was right: It’s everything. From the cards to the board to the bits, a game needs to be cohesive and have a great style to it in order to be attractive. As it sits, the art on City of Remnants’ board is simply very bland. It’s as if someone thought confetti glued to a black background would be a great way to show an image of a city from space, despite so many being widely available for examples. I mean, I know what they tried to do, but they simply didn’t execute it well. It’s not distracting, but it’s just so utterly forgettable and boring, especially in light of the otherwise outstanding art in the game, that I think it may be the sole thing holding it back from being talked about more, and more importantly, on everyone’s table. It’s just so impressive from a game play perspective that you have to overlook the art. I’m even considering creating my own board design and gluing it over the “factory” design. Yes, it’s so good that it’s worth the time and money involved in pimping it out properly. One of the most impressive parts of the game is how everything seamlessly blends together to provide a cohesive experience. The mercenary cards deserve special notice in this respect because of how they are the centerpiece of the game’s design, and they are flawless. First, when you buy a card, you get to put a new miniature into play, increasing your army, and thus the cards are your gang just as much as the miniatures are. 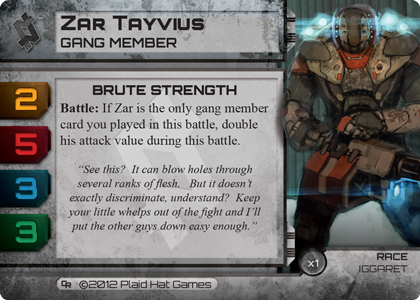 But that’s just the icing; the meat is that in continuity with the unique faction powers aspect of the game, each card is sort of “themed” to work with one gang, but is useful to all. Each card may be used by any player for its ‘power’ but that each card has a value of strength in battle for each faction, so that players may choose cards that benefit them in battle, benefit them through power, or if they are matched to your faction, the card helps for both. This means that the cards are a sort of social battleground, where there’s several competing reasons to buy a card; you can buy one for the power, for its battle strength, both, or to simply deny an opposing gang the opportunity to gain a card that is very useful to them but not as useful to you. In a word, it’s brilliant. Additionally, in a stroke of genius, there is an underlying mechanic of turn management, as it were, but unlike so many other games that have the “UGO-IGO” format, the turns are really rather dynamic in City of Remnants. For instance, during a player’s turn turn, they may choose to initiate bidding session on cards, which represents inducting new gang members into your cadre of thugs, and the person who initiates the bidding process chooses which of the four initially available cards is bid upon. Here’s the catch, though: if someone else wins the card, sure, they get the card, but they have to pay for it and lose an action for doing so. This allows sneaky bastards like me to sap other players of actions, and since there’s four available at the beginning of a round, and a new one is always available when they run out, you can literally run other players completely out of actions. Once a player is out of actions, they get skipped when their turn comes around, so you can start to muscle in on their turf with them powerless to stop you. Another really slick thing I’d like to point out is that City of Remnants has truly unique player strengths, but they’re not defined by them. Every one of the four gangs excels at certain things, but it’s balanced to the point of razor sharpness, which is another example of the tightness of design. What’s most impressive is the fact that you aren’t required to play to the strengths of your gang in order to win; you can play the ultra-aggressive faction as a “builder” and still win, just as you can play the “money engine” faction as a war-monger and win. That’s incredibly hard to do in a game design that has unique faction powers and yet Isaac Vega and the Plaid Hat team managed to pull it off with style and grace. Finally, due to the large volume of cards, pretty much every game will play differently, even if the same play styles or strategies are employed. On top of that, replay value is added in the fact that there are eighteen unique buildings that can be developed in the box, but only nine are available for any given session, so the mix of buildings varies greatly; I’ve played this game five times now and have yet to see two of the building types come up even once. Each is quite different in what it does and why you’d want to develop it, and the more powerful a building is, the closer to the center of the board it gets placed, meaning that it’s going to be under fire for most of the game. In short, this game should be on the short list for anyone who likes the “conquest” style of game. It’s a microcosm of everything that I love about DoaM games, and although it has a rather generic sci-fi fiction as a base, it is an impressive design that trumps virtually every game of its type that I’ve played, and in very smart ways. I think that the only flaws in the game are derived solely from the poor aesthetics of the board and the oversight regarding the building text not being on the back of the cards. This is not to say that these flaws are distracting or somehow muddle the game, because that could not be further from the truth. I passed on buying this at GenCon primarily because I spent almost all of my money buying Wreck Age models and Mice and Mystics, and I didn’t play this until the last day of my GenCon visit. Had I played it the first time, I’d have forewent buying some the models to pick this up instead. Luckily I was talking about how great it was with Jerry, who was kind enough to pull some strings and get me a review copy, which allowed me to write this article. And thankfully, this game has elevated itself to be placed on the “Forever” area of my game collection. It’s a phenomenal game and everyone I’ve played it with save one thought it was absolutely amazing. This game can be used as a litmus test to determine if you like DoaM-style games, without a doubt. It’s actually very easy to play, although it’s got a lot going on, and once you’ve played it once you’ll have no problem understanding it. It helps a lot to have the game taught to you by an experienced player, but that said, it’s not the mechanics that are hard to understand as much as the interactions of things. All in all, as someone who has spent way too much of my life playing DoaM games, I guarantee that this is among the very top-tier of this style. This game will very likely be one of the last games I ever sell off or trade, because it is simply that much better than virtually all of the other DoaMs that I own or have played. In short, this is Isaac Vega’s masterpiece. It lasted 4 hours our first game at GenCon with myself and 3 others,with one guy teaching it. It lasted 4 hours the next time with the Circus crew, 4 players. The next Circus crew game was about 3 hours, and the last game with 4, but reduced to 150 victory points was about 2 1/4. Don’t let the bland board dissuade you though, it makes up for that minor shortcoming in game play. There is no runaway leader, at least in our games, because people tend to “level up” pretty much within a turn or two of one another, and it’s not overpowered. The leader changes a lot, which speaks to the game balance, and I’d say that most of the big points plays happen in the last several rounds of the game when people’s long-term strategies come to fruition. The area control aspect of the game, which is a big part of it, keeps everyone fighting over key points, but there’s so many other combinations of factors that can get you VPs that you can have a small but very well-defended and lucrative position that you can win just by being clever and not “showing your cards” too early. I have yet to win, and it’s usually the sneaky fucker who builds he right buildings and has the right cards, yet stays under the radar, who seems to come from behind rapidly and surprise everyone.